Eugene Paul Williams, born November 6, 1925 in St. Mary, Ohio to Ervin Paul Williams and Lulu Annette Sullivan Williams, died on August 31, 2018 in Wilmington, Ohio. He was predeceased by his brother Robert Blaine Williams, and by his wife of 59 years, Hilda Irene McNinch Williams. He is survived by four children, Donna J. Myers (the late Robert Myers) of Springfield, Ohio, Dr. Michael E. Williams (Rebecca Custis Williams) of Charlottesville, Virginia, Barry L. Williams (Dr. Isabel Almase) of Orange, California, and Pamela S. Williams of Amsterdam, The Netherlands. He took great joy in his grandchildren, Shane Myers, Heidi Myers Edwards, Nathaniel Williams, Benjamin Williams, Jaap Botschuijver, Stephen Williams and Drew Smalley, and in his six great-grandchildren. Raised on a farm in Noble Township, Auglaize County, Ohio, he graduated from Blume High School in Wapakoneta and served in the Philippines as a Sergeant, U.S. Army during W.W. II. 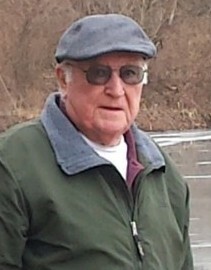 He and his family moved to New Vienna, Ohio in 1961, where he worked for Buckeye Molding Company and Wells Manufacturing until retirement in 2002. He enjoyed life on the family farm, and was a highly skilled electrician and craftsman, remarkably adept at carpentry, stone masonry and all things mechanical. He was an active member of the New Vienna United Methodist Church, the Lions Club, Masonic Lodge and Scottish Rites, and the Order of Eastern Star. He served in Boy Scout leadership for over 50 years, most of that time as scoutmaster for New Vienna Troop 97, and organized several expeditions to Philmont Scout Ranch in New Mexico. Among his many recognitions was the R. E. Hadley Distinguished Community Service Award in April, 2018 from Tecumseh Council, Boy Scouts of America. Gene and Hilda were devoted to family and community service, and will long be remembered for their many lasting friendships. Services will be held at Littleton Funeral Home in Sabina on Friday September 7, 2018, with calling hours 9 to 11 a.m. and service at 11 a.m., followed by burial in the New Vienna IOOF Cemetery. In lieu of flowers, please consider memorial contributions to Tecumseh Council, Boy Scouts of America, Springfield, Ohio or to Community Care Hospice, Wilmington, Ohio.